A full body workout coupled with a healthy and balanced diet is the secret to living and maintaining a healthy body and lifestyle. However, sometimes it is a struggle to stick to a strict diet and even more of a challenge to stay consistent with a daily workout routine. The thought of spending at least an hour doing cardio and adding another hour dedicated to muscle toning is already draining, even for the most determined person. Since a full body workout requires a lot of time at the gym, many tend to skip some parts of their routine, which isn’t advisable. A rowing machine helps people cut down their workout time without jeopardizing their progress. It is one of the lesser used types of gym equipment, but it is also one of the most effective at giving low-impact and high-intensity workouts. For people looking to fully equip their home gyms looking into a rowing machine, the Sunny Health & Fitness SF-RW5515 Magnetic Rowing Machine is a wonderful idea. Continue reading to learn more about the different features, the pros, and the cons that this machine has to offer. The annoying sound of a typical rowing machine can turn a person off from daily use. 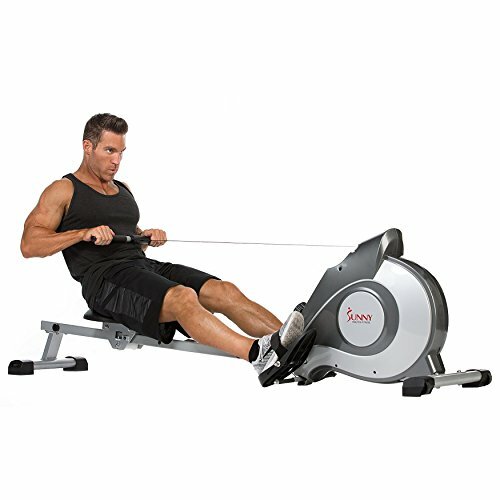 For those who are very sensitive to sound, the Sunny Health & Fitness SF-RW5515 Magnetic Rowing Machine is a great choice because it is virtually silent; you can enjoy a peaceful workout session or watch your favorite shows while working out. The machine also has a very small footprint. This means that it barely takes up any space in your home gym. Plus, you have the option to fold it up and store it inside a closet if you really want to maximize your space at home. The 8 different resistance levels are also a big plus because even at a low 2 your body is already sweating. Adding more resistance gives your heart and body muscles the workout it needs. At the same time, the higher resistance levels aren’t too much that you can no longer use them. The rowing machine allows you to slowly build up your strength and stamina. It is perfect for people who want to use the machine at home for years. Set up isn’t a hassle either. Instructions are very straightforward and easy to follow – your machine will be up and running in 30 minutes or less. A rowing machine like this one offers a fantastic workout for everyone at home. The simple resistance adjustment and the console that tracks progress are all beneficial for people who want to maintain their fitness for years. For a machine that is very compact and lightweight, it is very durable and impressively stable. With the right care and proper machine use, it can last years! For machines that break apart and are still covered under the warranty, contact the manufacturer immediately. They will gladly assist you with your issue and may even replace the broken parts for free. People who are very meticulous about tracking their progress may find that the LCD display is a little too small to make tracking convenient. It is also impossible to track the distance of each session as the console only tracks the number of strokes and not distance. These are just minor inconveniences that do not really affect the way the machine works, but if you are picky about the display settings and screen this may not be the rowing machine for you. There are also some manufacturing issues that result in the rowing machine breaking just after a few uses. If this happens to you, contact the manufacturer right away to see if they can replace the broken parts or the entire machine for free. To prevent early damage be sure to use the machine carefully and not be too aggressive with rowing. Take it slow and steady instead. Build up your stamina by making your sessions longer and not by rowing faster. When it comes to finding equipment for your home gym, mark the Sunny Health & Fitness SF-RW5515 Magnetic Rowing Machine as a top choice. It is affordable, compact, reliable, and most of all give your body the full workout it needs to stay fit and to keep your heart rate high.